Otis – like many other dogs that had limited exposure to the world as a puppy – is rather clueless about a lot of concepts. We take so many behaviors our dogs do for granted as “natural activities” that they’re just born knowing – like playing, sniffing out treats, working for food, etc. In reality though, dogs often need help learning these skills. Additionally, even though these behaviors might not come naturally to some pups, they can be so beneficial (see: Chick’s love of play on Love & a Six-Foot Leash). 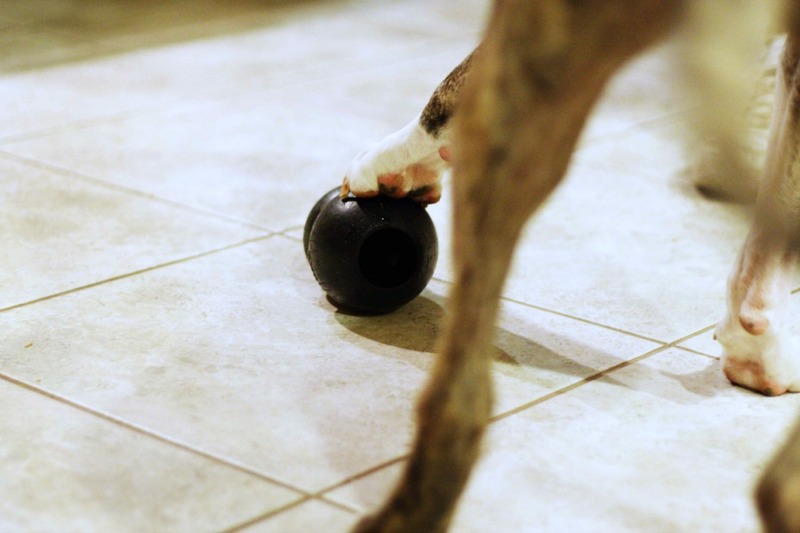 I’ve written before about Otis’ mental block when it comes to retrieving food out of a Kong. If it didn’t just naturally come out, he’d stare at it then promptly give up. He got better when it came time to slurp up yummy, frozen peanut butter – but he just couldn’t figure out how to make solid kibble (or other treats, for that matter) fall out of the Kong. This is where FosterGrandma and I stepped in. After my last post about Otie’s difficulties with food puzzles, you all gave me a ton of great suggestions about how to help him figure it out. I have yet to try, well, (oops – confession time) most of them, but what my mom and I did do with him was some clicker training. When in doubt with an insecure, unsure dog – clicker train! 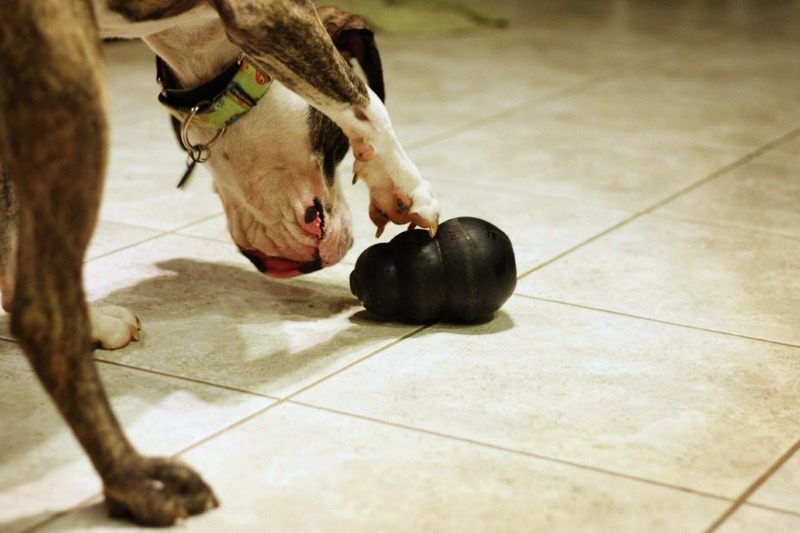 Our intent was to teach Otis to use his paw to move the Kong and make the kibble fall out. He’s already been exposed to the clicker, so he knows to expect a treat upon it’s use. 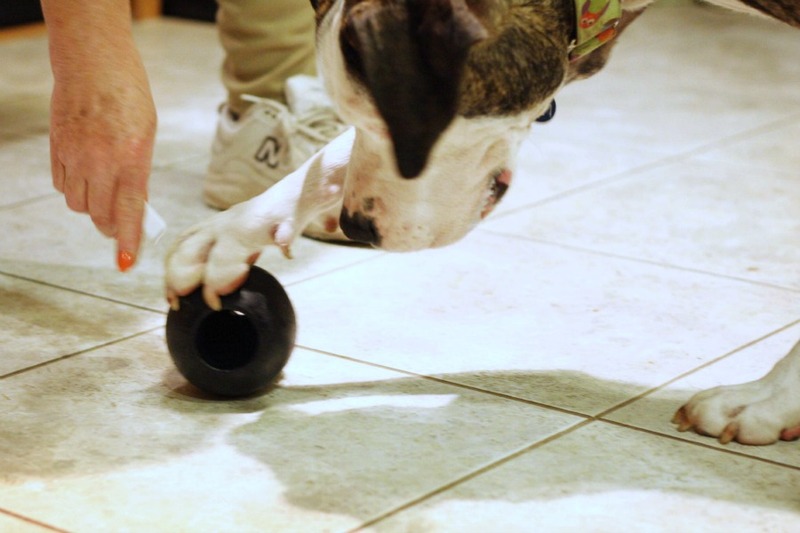 We started by clicking and treating any time he moved his paw towards the Kong. 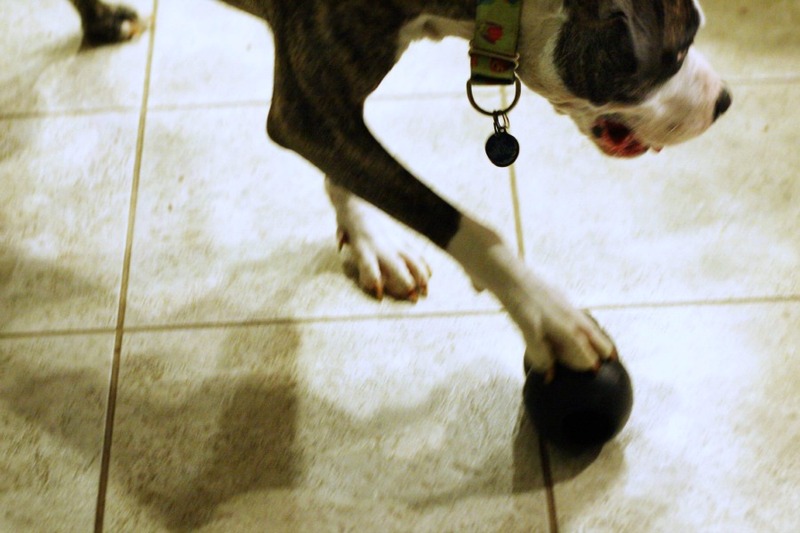 Then we clicked and treated any time he touched the Kong. Slowly he got the hang of it, and we were able to pair the verbal “Kong” cue with him touching the toy. It got to the point that whenever he was stuck, we just said, “Kong” and it would help him get the kibble out. Then he started using it all on his own! He hasn’t caught on to using it all of the time yet, but he’s better than he was before we practiced this command. Plus, now whenever he is stuck we can just remind him that “Kong!” helps to get the kibble out. Chances he realizes the connection? Not sure. But, for now, it is support to his pretty wimpy valiant Kong-tackling efforts. Next up is to try the recommendation of sticking his absolute favorite treat down at the bottom so that he doesn’t want to give up on fishing it out, and we’ll see how he does. That and then only feeding him from the Kong so he’ll have to figure out how to get his whole dinner out or go hungry – though I’m a little nervous he would let himself starve, the silly pup! But that’s a project for another day. In the mean time, I’ll just be proud of his most recent accomplishment. This entry was posted in Dog talk, Otis, Rescue/Humane Society, Uncategorized and tagged clicker training, food puzzles, for adoption, fostering, Kong, learning, nose work, positive reinforcement, teaching, training. Bookmark the permalink. Gotta love the wonders of the Clicker! Great post and brings up a concept people really don’t think about often. I guess I am much more aware of it due to having so many hunting dogs around. The smelling, hunting it out, search patterning, scenting ideas are what we are alll about. The more you play these “hunting” and nose related games the better bird dogs they turn into. 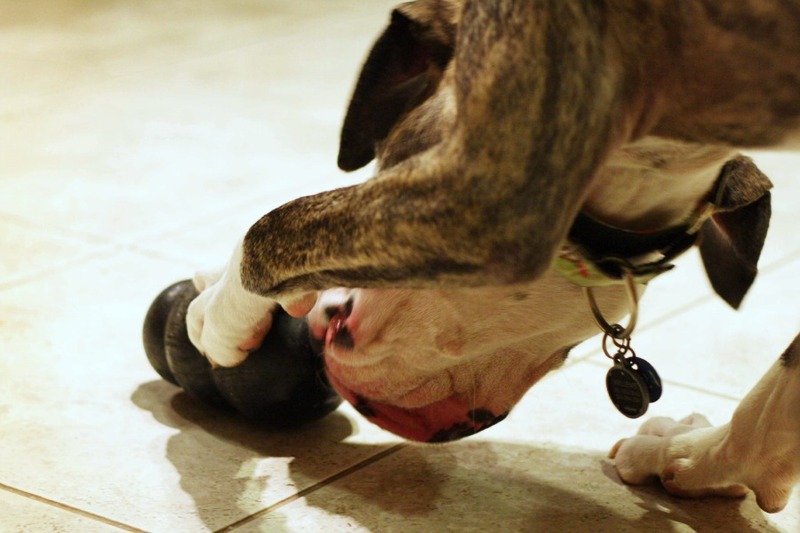 The clicker is a great way to help target an action related to these kongs. Good thinking! I do really think you should try a clear gatorade bottle with kibble in it, maybe spiked with some tastier smellier treats too. It really helped wyatt to SEE the treats. He picked up on the whole idea of picking it up and dropping it and knocking it around.